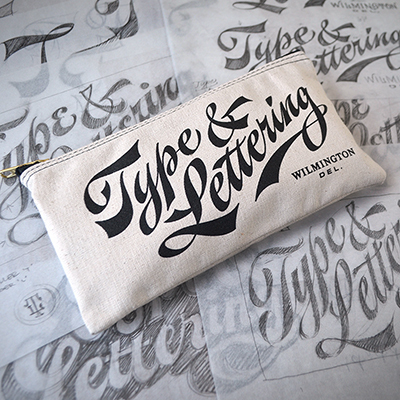 Just in time for the holidays, the latest Type and Lettering pencil case is now in stock! This handsome carryall is constructed of durable 10 oz. natural cotton canvas, and sports a rugged heavy-duty brass zipper. Meticulously printed with a striking new design, the 5” x 10” wallet is the perfect size for all your needs. Ideal for storing art and office supplies, make-up, laptop and mobile device accessories, travel items, important paperwork or just straight up cash ducats y’all, each bag is handmade in the good ol’ U.S. of A. It even comes with an authentic Type and Lettering pencil to get you started! Order yours today!